For any traveler looking to experience something new and head off the beaten path for magical memories and awe-inspiring experiences, look no further than Mr Linh's Adventures. Operating all around the beautiful nation of Vietnam, as well as Laos and Cambodia, Mr Linh's Adventures provides a wide range of both guided and self-guided tours on various themes like culture, history, water, cycling, nature, adventure, and discovery. Mr Linh's Adventures got its start back in 2008 and has established itself as one of the leading tour providers in Vietnam and neighboring countries. This tour operator really excels in tour variety, quality, and customer service, offering everything you could hope to find from a tour operator in some of the most beautiful regions of Asia. Both the founders and staff of Mr Linh's Adventures are local people with a passion for their homeland. They know Vietnam, Laos, and Cambodia better than anyone else, able to take you to all the most popular locations and world-famous landmarks, while also offering you a little trip off the beaten path to the sorts of hidden gems and overlooked treasures that other travel companies simply don't even know about. Booking a tour with Mr Linh's Adventures is a wonderful idea for many different reasons, with the company taking care of everything for you. They'll arrange accommodation, transport, excursions, and experiences. All you need to do is request the trip you'd like and speak with the staff if you'd like to customize or adjust any part of the experience, then sit back, relax, and wait for the adventure to begin. You'll be treated with the utmost levels of care and attention from the first second of your trip to the last, with Mr Linh's Adventures' staff going above and beyond the call of duty to make each moment of your tour as magical and memorable as possible. So if you want to enjoy a wonderful vacation in Vietnam, Laos, Cambodia, or a combination of these three countries, while also supporting a local business and being guaranteed world class customer service, total security, and incredible experiences, all at attractive, affordable prices, Mr Linh's Adventures is the name to choose. Mr Linh's Adventures offers a huge variety of tours all around Vietnam, Laos, and Cambodia, with several multi-country tours also available. Whether you're more interested in roaming city streets, visiting ancient temples, exploring the wilderness, relaxing on beautiful beaches, enjoying adrenaline-boosting activities, or making magical memories, Mr Linh's Adventures will have a tour for you. The company also runs fully customized tours, allowing you to speak directly with Mr Linh's Adventures' trained and experienced staff to tailor-make a bespoke vacation itinerary just for you and your group. To arrange a customized tour, all you need to do is visit the official Mr Linh's Adventures website and get in touch. You can share some ideas and a basic layout for your trip, listing the locations you'd like to visit and the things you'd like to do along the way. From there, the staff at Mr Linh's Adventures will take all that information and communicate back and forth with you to create a customized Indochina experience that will match perfectly with your needs, desires, and budget. If you'd simply prefer to pick from the long list of pre-packaged tours from Mr Linh's Adventures, you can browse the full catalog on the site. There are many different tours available to suit every kind of traveler. Active people will love the cycling and water-based tours, while those looking to learn more about the history of these locations will appreciate the historical and authentic tour options. With so many tours to choose from, picking the best option is simply impossible, but here are some details on a few of Mr Linh's Adventures' most popular tours. The Heritage Sites of Vietnam tour from Mr Linh's Adventures runs for 12 days and 11 nights and is a perfect pick for people who really want to soak up the history of this incredible country, witnessing its majestic natural beauty while also visiting the most renowned and impressive heritage sites like Hoan Kiem Lake and Ngoc Son Temple in Hanoi or the Royal Citadel and Forbidden City in Hue. For a full Vietnam experience that you'll never forget, sign up for the Authentic Vietnam tour from Mr Linh's Adventures. This is a three week tour that offers the full spectrum of Vietnam experiences, letting you enjoy almost every aspect of this country and really feel like you've lived your Vietnam vacation to the fullest. You'll see some extraordinary man-made locations and natural landscapes as you journey from Hanoi to Phu Quoc Island by way of Sapa, Ba Ba, Halong Bay, Hue, Danang, and many other locations. 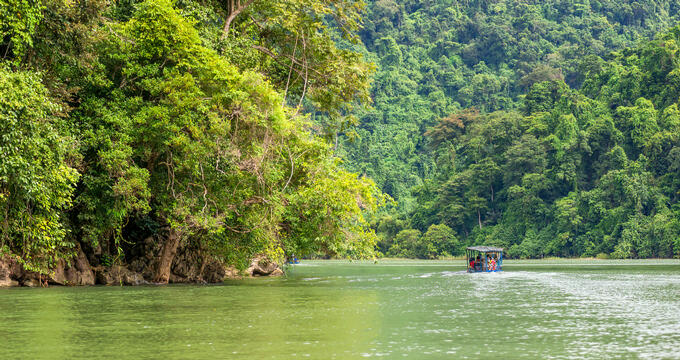 If you don't have too much time to spare but want to experience a whole lot of adventure in a short period, the Souther Laos Adventure tour could be a good option. This tour runs for five days and four nights in total and takes in the indescribable beauty of Southern Laos. You'll visit places like Done Khong, Dong Daeng Khone Phapheng Waterfall, Wat Phu Temple, and more, meeting with locals and tasting foods you've never known before along the way. The Cambodia Highlight tour from Mr Linh's Adventures is another short but sweet option for travelers who are limited on time but want to make the most of every single second. Essentially, as the name suggests, this Cambodia Highlight tour focuses on the major locations of Cambodia like Angkor, Siem Reap, the Royal Grand Palace, Wat Banteay Kdei, Prasat Kravan, and more.